I know my blog output has suffered recently, but having a job where I (now) have to write for a living and trying to write a book don’t leave a whole lot of time for blogging. I’ve learned a lot in my time since I moved up to DC and my first full-time job, and I have a lot to share about my experience that fits in with the original bent of 40 Acres, humorous takes on situations affecting young black professionals. Well, now that I’m figuring out a good writing schedule again, I’m revisiting that stuff (especially our Survival Guide entries) with more experience and insight. Welcome to the new 10-part Office Survival Guide. Enjoy. 1. Make sure you’re going to a barbershop that cuts “your” hair. This may seem like an obvious thing, but Supercuts probably isn’t going to give you everything you need. I mean, if you go to Supercuts already, that’s fine. That’s where Kevin Durant gets his hair cut too. But if you’re serious about this, you’ll want to find a place where your barber knows what a taper is, knows what direction to cut your hair and asks you whether you want your sideburns squared or pointed. A Black Barbershop. Usually Yelp will be helpful with this, as a search for “Black Barbershop” will usually turn up some good results. If you’re unsure, read the reviews or look where the shop is located. If it’s on a street named after a Civil Rights leader, you should be good. If none of this works, or if you work in a city without a large Black population, you may have to find a Black guy roaming the street to ask him where he gets his hair cut. Just use the Black Nod and don’t ask Kevin Durant. 2. Now that you’ve found potential shops, now is time to scout them out and figure out which one is right for you. If there’s only one, skip down a step to finding the right barber. Look at the folks going in and out of your target shop. Do they have good haircuts? Do they appear in good spirits? Are the haircuts affordable? (Hint: try to stay away from shops without posted prices for standard cuts). 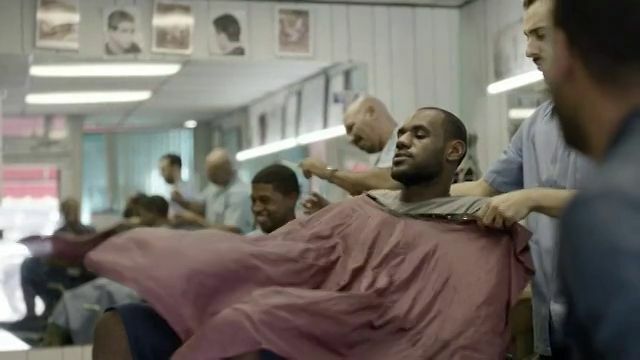 Is Lebron James enjoying a mirthful conversation about his ravaged hairline with your barber? But seriously, feel the place out before you get your haircut. Get to know the inevitable CDs/DVDs guy and the Incense Guy. Get a feel for the conversation. Most shops tend towards sports, but the ones in DC tend more towards politics. After you get comfortable, and even inject commentary on your own, now’s the time to find a barber. 3. Don’t pick the guy in a crowded shop with an open chair. 4. Don’t pick this guy. The old guy has shaky hands and will push your line back in time like Stevie Wonder’s. Don’t do it, even in a hurry. A line is a terrible thing to waste. 5. Don’t pick this guy. The guy with dreads is never your friend. He’s better than the old guy, but not by much. And if the Old Guy happens to also be the Guy with Dreads, run. Don’t come back to the shop. 6. This leaves you with a few options, usually the Barbershop Owner, his First Mate, and the Corner Philosopher. Each of the three has a different style, and you have to decide which one is for you. The Barbershop Owner is the most professional of the three and will give you a good haircut quickly and the way you want it. His chair is usually full, and you’ll have to wait a bit, but he’s pretty responsive to appointments. The First Mate is the best cutter-of-hair in the shop. This man is an absolute savant with the clippers. He will make you look exactly like one of the model cuts on the posters. But his style comes with drawbacks; his chair is always full, he ALWAYS forgets appointment, and he will inevitably always be on the phone with someone. The Corner Philosopher is easily identifiable by his presence in leading whatever debates and conspiracy theories prevail in shop conversation. His appearance itself may vary, as Corner Philosophers can come from a wide variety of African-American Studies majors, Nation of Islam members, and Prison Platos. But he will always greet you with an intricate dap and call you “Brother.” This guy gives the least consistent haircuts out of your preferred barber targets, but he has the shortest chair wait times and usually is available without an appointment. Whether or not he is your preferred barber depends on if you enjoy being regaled with tales of fringe Black Panther racial conspiracy theories or not, but this is usually the guy I go to. He’ll be the most likely to remember you and your cut and the most likely to have honest and relaxing code-switch-free conversation with. Building a good rapport with your barber is key. 7. Establish your limits. If your barber has a rack of hair dryers, markers, or other unnecessary tools at his disposal, you have to let him know what you need and what you don’t. Don’t get a razor line if you don’t want. Don’t get one of those pencil Johnny Depp mustaches if you don’t want. Don’t let him arch your eyebrows if he’s itching to do it (this is apparently a thing in DC). Control your haircut, and you control everything. Don’t walk away from your haircut looking like a Ken doll, if that’s not your thing. And tip your barber. This could be you. Don’t let this be you. That’s it for the first guide. Hope you found it entertaining and maybe a little useful. Come back next week for the next guide. Why don’t you trust the barber with dreads?